Ice storms are caused by freezing rain. When falling rain comes into contact with a freezing cold surface the rain turns into ice on contact. The freezing rain covers everything in smooth ice which on surfaces such as roofs and roads is particularly dangerous. 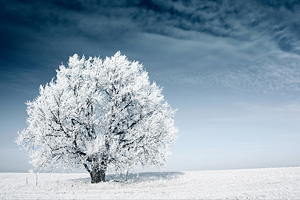 The weight of the ice can break tree branches and can affect power and telephone lines. What Causes An Ice Storm? Freezing rain begins as snow, which falls from a cloud towards earth and melts completely on its way down through a layer of relatively warm (above freezing) air. As it falls toward the earth's surface, it enters a layer of colder air and becomes supercooled. On contact with the ground the ice can accumulate to a thickness of several centimetres, called glaze ice. Where Do Ice Storms Occur? Ice storms are an important occurrence in North America and Canada. Where Are The Dangers of Ice Storms? The dangers are similar to snow storms: vehicle accidents, hypothermia, fires and carbon monoxide poisoning. Over 500 lives are lost each year in the USA due to carbon monoxide poisoning, mainly resulting from using alternative heat generators due to loss of conventional power. In 1998 up to 4 inches of freezing rain fell over Canada and the north-eastern coast. Three million people lost power, some for as long as 6 weeks. Between 14 - 16th December 2005 the southern states of the US were affected by an ice storm. It caused power outages and 7 fatalities. In early January 2005, Kansas was declared a major disaster zone due to an ice storm. The storm caused over $39 million in damages to 32 counties.